EVENING GAZETTE—FRIDAY, NOVEMBER 16, 1962. A PICTURESQUE village green, rural, Lancashire's best kept village inn (badly damaged by fire earlier this week) and, as the local girls will tell you, nearly 2,000 young menthe pretty village of Weeton has them all. 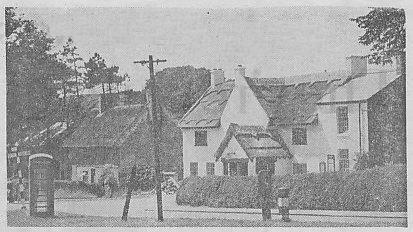 Weeton—looking across the village green to the Eagle and Child before this week's fire which destroyed the thatched roof. For of the population of around 3,000 people, 2,000 of them are at the large RAF camp just outside the village. Most are young men —and many are bachelors. Weeton's connections with the Royal Air Force have made it one of the best known villages in Britain for, since the first blue uniform was seen in the village in May, 1940, when the camp opened, something like 50,000 airmen have passed through RAF Weeton on trade training courses. Some have married local girls before going to postings all over Britain and throughout the world. When I visited the camp, I talked with its commander, Group Captain R. R. Holder who has been at Weeton for two years.I learned that Weeton trains airmen for aircraft engineering, mechanical transport, general engineering and other fields. On the camp are three churches, a first class entertainment centre with ten-pin bowling and dances, and a children's school with about 100 pupils which also caters for a number of civilian children, too. The camp has its own cinema, amateur theatre broadcasting service and caters for practically every hobby and interest imaginable. Not only does the camp give employment to about 300 local civilians but it has a rateable value of £19,140 of the Weeton parish total of £24,674. Thus it is mainly responsible for giving Weeton a penny rate product of £101 —one of the highest in the Fylde. I had heard that the camp might be reduced in size over the next few years but Group Captain Holder put me right on that score. He told me that there were no plans to reduce the camp and. in fact, consideration was being given to replacing the present huts with permanent brick buildings. In fact, the Air Force has enjoyed good relations with the village throughout its existence. Some airmen are at Weeton for less than a week, others for twenty weeks, but most for about fourteen. However long they stay, I'm sure they'll enjoy the village which is still largely a farming stronghold. There is no large scale development planned but the Fylde Rural District Council are to build a small number of houses in the village. Many people visit the village in the course of a quiet country walk and a more charming spot is difficult to find in the Fylde. Just off the picturesque village green you'll find one of the most fascinating pubs in the Fylde—the Eagle and Child. In 1958, snowploughs from RAF Weeton assisted the local authority in snow clearing and, in 1961, when a train was derailed near the village, medlcal teams and airmen from the camp were on hand to give assistance. One of the few remaining Fylde links with the Cromwellian rebellion, the charming pub whose thatched roof was swept by flre earlier this week, dates back to 1540. Before being acquired by a St Helens brewery in 1954 it was the property of Lord Derby. At that time it was completely redecorated and furnished in keeping with its historic origin. As a result, inside you'll find swords and spears adorning the walls, gleaming brass and polished oak. Particularly with young people from Blackpool and St Annes, it's a popular rendezvous, not to mention villagers and RAF personnel. The pub was this year voted rural Lancashire's best-kept inn in the annual competition. Weeton Parish Council consists of five members, three of whom are farmers. The Chairman is Coun T. Fenton, of Smithy Cottage, who works at the Fairfield Experimental Horticulture Station at Greenhalgh. Delegate to the Fylde Rural District Council is Coun J. R. Richardson, of Swarbrick Hall, Weeton, a famer, and other members are Coun T. S. Critchey, of Mythop Grange. Weeton, and Coun J. T. Smith, Hill House, Weeton (both farmers), and Coun P. C. Tudgley, of Church road, Weeton, an ambulance employee. One of the parish council's chief concerns at the moment is the future of the village hall, focal point of the community, which has seen hundreds of village wedding receptions, dances, whist drives and Women's Institute meetings. "The present one, an army building taken over after the First World War, is just about tumbling down," Coun Richardson told me. Determined to preserve this amenity, the village 18 months ago decided to build a new one on the site of the old. Meetings are held regularly to discuss ways of raising money before applying for a grant or loan, and almost everyone in the village and many tradesmen from other parts have subscribed. Dances and other social ebents are used as fund raisers for the hall and there is a general determination to get it built, although no final estimate has been agreed upon from several obtained. Certainly, a new village hall will be a boon to the social life of the village, not least to the young people, some of whom now seek entertainment at the RAF camp, others in Blackpool.